He puts dates on the next steps to be taken in preparing to build “an architectural symbol of remote Australia”. KIERAN FINNANE reports. 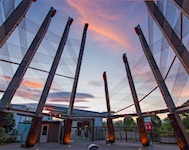 Pictured is an artwork at the entrance of Te Puia, the Maori arts and crafts institute at Rotorua, NZ. Choice of illustration is ours.